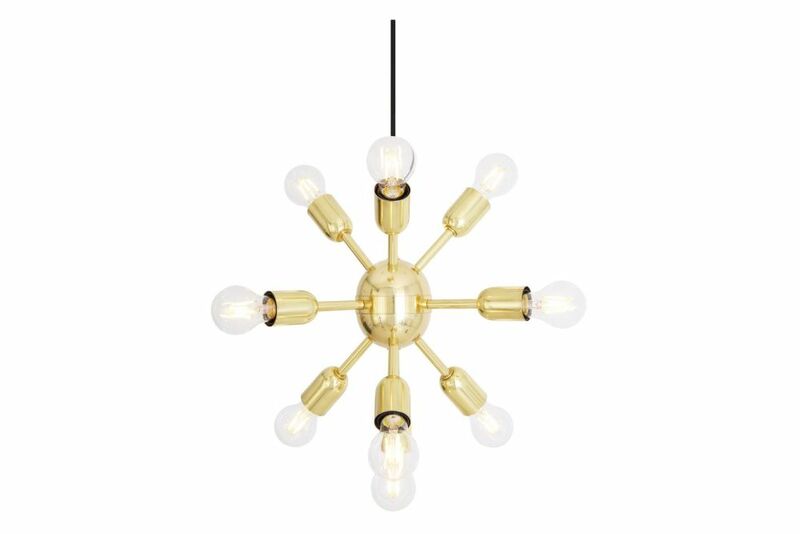 The Glenties light fixture is a small sputnik chandelier with 10 arms radiating from its brass centre. It's a miniaturised version of Nagano sputnik chandelier. The Glenties sputnik chandelier is suspended using black or brown round braided cable. A matching ceiling rose is provided. Ten 70mm brass sleeves radiate from the chandelier's central sphere. An E27 brass lamp holder is fixed to the end of each sleeve. The sputnik chandelier’s design allows light to be emitted in all directions. The exposed bulbs ensure that all light travels freely around the chandelier’s installed environment.